Use these Boys Toys stainless steel cookie cutters to make great lunch box sandwiches. This 5 piece set comes with a Car (11cm W x 6cm L), Ute (8cm W x 4cm L), Tractor (8cm W x 6.5cm L), Hammer (6cm W x 10cm L) and Wrench (4cm W x 10cm L). These cookie Cutters are made from stainless steel and do not rust. Includes a basic cookie/biscuit recipe to use with your cookie cutters. Great for cutting fondant to decorate that special birthday cake with boys toys images. 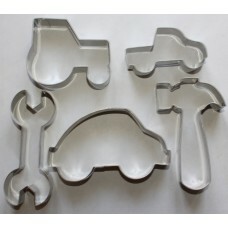 Use this 5 piece stainless steel, non rust cookie cutter set for your next farmyard or 1st birthday .. Create great cookies for your little builders construction party. This 5 piece set consists of Hamme.. Perfect for creating sea creatures for that Beach or Pool Party. This 5 piece stainless steel cookie..
Complement your birthday party with decorated cookie or biscuits in the shape of planes, trains, bul..
Fireman Cookie Cutter Set includes cutter of a Dog (9cm W x 8cm L), Fireman Hat (7cm W x 5.5cm L), F.. There are 9 stainless steel numbers in this cookie cutter set. Use to create gorgeous number c..